This magnificent performance of Mahler’s Sixth was given at a Henry Wood Promenade Concert. Before discussing its many virtues I feel duty bound to point out one serious issue, which may be a fatal flaw for some prospective purchasers. At the very end of the massive finale, after the final despairing chord has been almost wrenched out of the orchestra, Mahler has the music die away into a black emptiness, the ending marked by a single, dull pizzicato note on the strings, underpinned by the bass drum. At this point, even before a momentary silence has been achieved, some senseless idiot emits a loud “bravo”. At a stroke, this self-indulgent, thoughtless action shatters the atmosphere so masterfully built up by Tennstedt and his players over some eighty minutes. Worse still, that’s the cue for his Gadarene colleagues in the audience to commence a huge ovation. Clearly many in the audience that night simply didn’t understand what they’d just heard. Mahler and Tennstedt had taken us to the edge of the abyss and surely after such a performance what one really wants to do is let out ones breath, gather ones thoughts and then - and only then - show ones appreciation for the performers and the music. I’m sorry if this all sounds like a Victor Meldrew-style rant but really the person responsible for the “bravo” should hang his head in shame. It’s as well to mention this up-front because the snag with having this grotesque piece of attention seeking perpetuated on disc is that the listener will always be aware that it’s coming. That said, collectors should try not to be put off, especially if, like me, they’re admirers of Tennstedt in Mahler, for this blistering performance really is something rather out of the ordinary. I think it predates his studio recording for EMI. My copy of that version gives no recording dates but it was issued in 1983. As ever, Tony Duggan’s views on the Sixth and many of the available recordings of it is required reading but in his latest comments on this symphony, Tony only mentions the Tennstedt EMI account in passing. He doesn’t care for it, joining those commentators who have reservations about Tennstedt’s overtly emotional approach to Mahler. Tony feels that in this symphony Tennstedt - and Bernstein - “turn Tragedy into Melodrama too often by much intervention of their own personalities in mannerisms of emphasis of phrasing and colouring and tempo.” That’s a view that one can’t overlook and I respect it but for once, having known the Tennstedt EMI recording for many years, I reluctantly part company with Tony, at least partially. 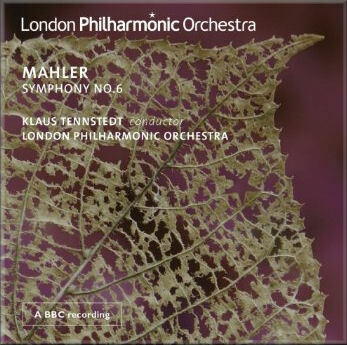 Tennstedt’s is by no means the only way with Mahler but at his best he is a supremely involving and committed guide to the Mahler symphonies and I suggest he’s very much at his best in this live performance. Interestingly, however, Tony goes on to say of Bernstein and Tennstedt’s approach to the Sixth: “Wonderful as "one-off" experiences in the concert hall, I have no doubt, but for repeated listening the creative detachment that I prefer and believe more appropriate for the work makes for a more surer guide over time.” I’ll come back to that comment at the end of this review. In the present traversal the first movement begins reasonably briskly, the basic pulse not dissimilar to that adopted on the EMI recording. However, as the movement progresses and the excitement builds, Tennstedt steps up the pace somewhat, though not excessively so, in the brusque march music. This is the main reason why he shaves about a minute and a half off the timing as compared with the studio reading (23:02 here, 24:34 on EMI). The pace isn’t as frenetic as that adopted by Bernstein in his first, New York recording but Tennstedt certainly invests the music with the energy called for in the first part of Mahler’s Allegro energico, ma non troppo marking. The forward momentum is excellent and well judged and when the ‘Alma’ theme appears for the first time [2:28] there’s plenty of passion. The exposition repeat is taken. Later in the movement, at cue 21, when the cowbell-decorated episode is reached [11:28] the bells and the Celeste are nicely balanced. Further evidence of Tennstedt’s attention to detail comes just a few bars later, when a three bar phrase on muted violas is brought out in a way I can’t readily remember hearing before; the effect is telling. This whole nostalgic passage is well shaped by Tennstedt. Throughout this movement - and indeed throughout the entire symphony - the orchestral response is superb. The playing is incisive and hugely committed - the horns, in particular, richly satisfying. The playing is also precise and I never cease to wonder at Tennstedt’s ability to get orchestras to play so accurately for him since his beat was really rather imprecise - a friend, also an admirer, once affectionately described his stick technique as reminding him of an agitated stork! The coda, led first by exultant horns [21:58] with the gauntlet then picked up by the trumpets, is exhilarating. Many scholars and commentators now contend that the Scherzo of this symphony should be placed third and the Andante second. Mahler certainly vacillated over this question though it appears that he came to prefer the Andante to be placed before the Scherzo. Pace the composer’s apparent preference and the weight of much informed scholarship I’m afraid I unrepentantly prefer the scherzo to come second. It seems to me that there is a kinship between the musical material of the first movement and the scherzo that makes it imperative that the two movements follow each other in the way the at the first two movements of the Fifth belong together. There’s also the not inconsiderable question that placing the Andante third offers the listener - if not the performers - some emotional respite before the huge canvass of the finale is encountered. I’m happy to say that Tennstedt, in common with many other conductors, places the Scherzo second. He leads a pungent account of the movement and for much of the time the music crackles. However, not all the music is of this nature. The trio section, marked Altväterisch (“Old fashioned”) is spiky yet calmer. Tennstedt takes it at a pace that’s quite deliberate. However, these episodes are brushed aside by the biting main material of the movement. In these stretches Tennstedt draws sharply characterised playing from the LPO, bringing out the grotesque side of the music. There are dark demons at times in this movement and Tennstedt makes sure they get noticed. He leads a spacious and well-moulded reading of the Andante. The woodwind section plays particularly well for him at the start and later the strings are in red blooded form. The tone becomes more passionate at around 5:44 and Tennstedt and his orchestra respond excellently. Later, at cue 100, [12:23] the music is really ardent and the intensity of the playing is astonishing. My one cavil is that the interjection of the cowbells isn’t as telling a presence as one would like. However, this is a very convincing account of the movement. The huge finale is massively demanding, not just on the players but also on the listeners. As was the case with the first movement, Tennstedt’s reading is tauter than in his EMI recording. In that version the finale plays for 32:55. Here, the music lasts for 30:40. The chilling opening, with its darkly imagined scoring, is brought off splendidly. When the allegro moderato is reached (cue 109, 5:05) Tennstedt impels the music forward powerfully, screwing the tension up incrementally over the succeeding pages but never, to my ears, overstepping into hysteria. When the mood lightens somewhat at cue 117 [7:43] the playing has a good spring to its step and the contrast with what has preceded this passage is well achieved. Mahler’s dark, dramatic turmoil resumes and gradually he builds up to the first of the two hammer blows (like most conductors Tennstedt eschews the third blow that Mahler quickly removed from the original score). When it comes [12:49] the blow itself is rather a disappointment. I don’t know what means the LPO percussionists adopted to try to achieve this powerful dull thud but it doesn’t come off, though as a “conventional” climax the moment is exciting enough. Matters are no better when the second hammer blow arrives [17:37] but immediately after that the full force of the orchestra is unleashed, as it should be, and the music is turbulent and frightening. From cue 150 onwards [22:36] the performance is especially visceral, the intensity of Tennstedt’s vision of the score quite overwhelming. When the bleak coda is reached the trombones and horns intone this desolate passage with controlled despair before the last fortissimo chord brings down the tragic curtain. This is a superb performance that gripped me from start to finish. I found myself completely convinced by Tennstedt’s vision of the score. His orchestra plays like men and women possessed and meet every demand that he and Mahler make of them. The shamefully intrusive cheer at the end is a blot on the landscape and is one which would have defied any attempts to edit out. Having said that LPO Live were right to issue the recording for the distinction of the performance overall is such that one can only be grateful to have it available. I wonder, do they have concert performances of the Second and Third symphonies in the archive? For now, however, this very welcome issue stands as a splendid testimony to the Tennstedt/LPO partnership at its peak. Early on in this review I quoted Tony Duggan’s view that the Tennstedt way with Mahler’s Sixth might be a wonderful experience heard once in the concert hall but less appropriate for repeated listening. What we have here is precisely that one-off experience and it’s important to bear in mind that when the performance was given no one ever dreamt of it being preserved for repeated listening. It will be evident from my comments above that I esteem this performance very highly indeed. That said, I know what Tony Duggan means; this is not an approach to the Sixth that works for everyday listening - if one can ever truly listen to such a work “everyday”. No, Mahler’s Sixth -like his Ninth - is one of those special occasion works that we are in danger of diminishing if we listen to it too often. So I mean it as a sincere compliment when I say that I don’t recommend this recording for frequent listening. This is a very special performance but it’s one to handle with care and to listen to - very attentively - from time to time. It certainly supersedes the EMI studio recording but it’s not the only way to experience this amazing symphony. The recordings by Thomas Sanderling (see review), Marrss Jansons (see review), Mitropoulos (see review). Barbirolli (see review and review) and Horenstein (see review) are among the versions that truly demand a hearing. But don’t overlook this Tennstedt account. It’s something rather special.